The Winter 2014 issue of Advance focuses on research that will improve patient diagnoses as well as improve patient care in areas where the University of Tennessee Graduate School of Medicine excels in nationally recognized research. It shows how research begins in the laboratory setting and then moves into the clinical setting. 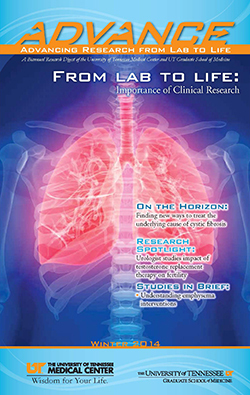 This issue discusses the work of Dr. Ludwig, the clinical trial team, and Vertex Pharmaceuticals, Inc. as they study the underlying cause of the gene that causes cystic fibrosis and its protein product; unearths the work of Drs. Branca, McCormack, and Shamiyeh as they participate in the EMPROVE trial, which is minimally invasive lung volume reduction for patients so they do not have to undergo surgery, and divulges the work of Dr. Karlstad as he and his research team create experiments that demonstrate the therapeutic potential of atmospheric plasma to improve wound healing by the removal of microorganisms from the biofilm of chronic diabetic wounds. There is also ongoing research that will impact the diagnosis of cardiac amyloidosis, the use of rejuvenation hormones, and the treatment of pneumonia. Advance is published twice yearly to spotlight research programs at the UT Graduate School of Medicine and explain how the work of the institution's researchers impacts healthcare in Tennessee and beyond. Join the Advance mailing list to receive Advance in the mail.